I am thrilled to announce that Grammy award winning David Ball has a new project paying tribute to the great music of Uncle Walt’s Band, called David Ball & That Carolina Sound, featuring Warren Hood & Marshall Hood. Here is a link to the band live. Walter Hyatt, Champ Hood, and David Ball formed Uncle Walt’s Band. They moved from Spartanburg, South Carolina to Nashville, Tennessee, in 1972, where they caught the attention of Willis Alan Ramsey, a famous and revered Texas singer and songwriter. Luring them to his studio, Ramsey would become the band’s first noted fan. The band returned to the Carolinas in 1974, recording Blame It on the Bossanova, their first record, at Charlotte, North Carolina‘s Arthur Smith Studios. In 1978, Uncle Walt’s Band played a reunion gig in Austin, Texas, and the success that followed kept the band together in subsequent years. That success wasn’t limited to the South, however. Uncle Walt’s Band gained a cult following around the world, ranging from the University of California, Berkeley to Moscow University in Russia. UWB released two more albums on the local Lespedeza label, 1980’s An American in Texas and 1982’s Uncle Walt’s Band Recorded Live, which was recorded at the Waterloo Ice House in Austin. In 2007, during South by Southwest, the Austin Music Awards put together a tribute to Uncle Walt’s Band. 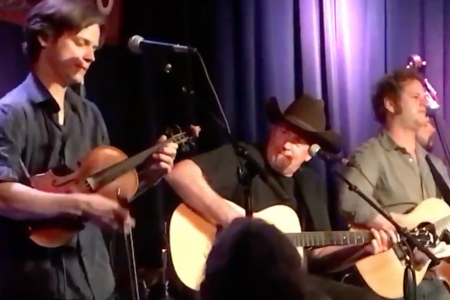 Lyle Lovett and David Ball were joined by Champ Hood’s son singer, songwriter, and fiddle player, Warren Hood, and Champ Hood’s nephew, singer, songwriter, and guitarist, Marshall Hood of The Belleville Outfit.